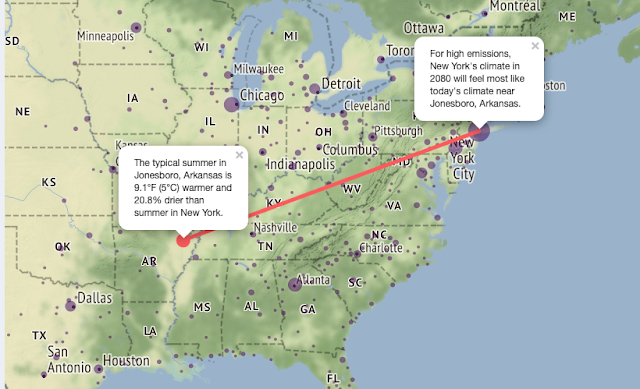 Climate change is a slow moving beast, something that sneaks up on you like fog, not seeming to be there until it is, something readily seen in an interactive map showing what the climate will feel like in 60 years, courtesy the University of Maryland. What will climate where you live feel like in 60 years? Over the next few decades, global climate is expected to undergo a dramatic transformation in an ongoing response to greenhouse gas emissions. What do we expect future climate to feel like and how might this change if we reduce emissions? 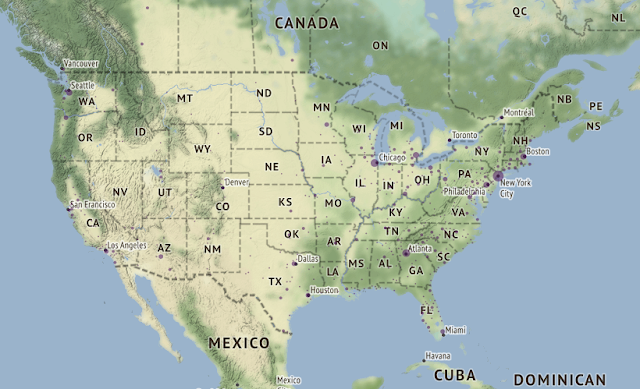 We answer these questions by finding the present-day location that has a climate most similar to that expected by the 2080’s in each of 540 cities (shown as purple dots on the map). We do this for different rates of emissions and a variety of climate models. We used 12 different measures to describe climate, including minimum and maximum temperature and total precipitation for winter, spring, summer and fall. We considered two emissions scenarios – one that assumes high current emissions continue and one that assumes emissions peak mid-century and then decline. We also considered numerous future climate forecasts as generated by 27 different climate models. An interesting, but not necessarily surprising finding is that there are no perfect matches. In other words, for no city did we find a present-day climate that is identical to a city's climate in 2080. In fact, because of the magnitude of expected climate change, for many cities the “best” match is not all that similar. This means that many cities could experience a future climate unlike anything present in North America today, especially if rates of greenhouse gas emissions are not reduced. Check out this amazing map as CC's impact on man is accelerating as we mover closer to 2080. NYC's climate = Jonesboro Arkansas' 60 years hence. Interesting is it not?